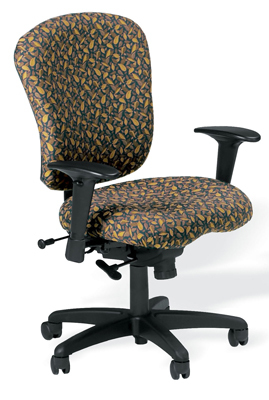 Seat: 20"W X 17-22"H X 18"D; Back: 20"W X 19.5-22.5"H with 3" height adjustment; thick/supportive seat cushion; standard with seat slider, easy access tilt tension knob; lever activated seat height/tilt. Lumbar position off seat can be adjusted in range from 6" - 10". Arm height range 3.5"; range off seat 7"-10.5". Arm pads constructed of a soft urethane material molded over a sturdy metal plate. Arm rest width 1.5" horizontal adjustment each are, 3" total; 3" height adjustment each arm. Five star reinforced base with carpet casters; black shell only. Delivery in 90 days. Customer must specify fabric color. WEIGHT CAPACITY 250 LBS. SEAT: 20"W X 17-22"H X 18"D; Standard with seat slider and 5" seat height adjustment; Back: 20"W X 23.5"H with 3" height adjustment and reinforced back structure around mesh back that conforms to body for more comfort; tilt mechanism allows free float or 3 lockable positions; 5 star reinforced base with carpet casters; black shell only. Delivery in 90 days. Customer must specify fabric color. WEIGHT CAPACITY 250 LBS.